The following is a guest post by Michael Akinlaby. Akinlaby is a freelance writer and SEO expert. He’s the founder of RankRain, an Internet marketing agency that specializes in Search Engine Optimization. “Social media” is a term almost everyone knows today. Today, you can sit in the comfort of your home, read and analyze the news, shop, connect with your friends, mentors, favorite celebrities and meet new people. That’s the power of social media. Social media is even more amazing than using it to read the news, connect with friends and meet new people. Social media is also a great platform to market your business and get thousands of customers to buy your products and services. Social media is a great place to build brand ambassadors and get people talking about your business. Social media is a place where you can hijack the customers of your top competitors. Social media is also a great place to turn dissatisfied customers into satisfied customers, something that would have been impossible or expensive without social media. If you’re not using social media to promote your business, then you’re missing out on one of the best ways to get high-quality customers for cheap. 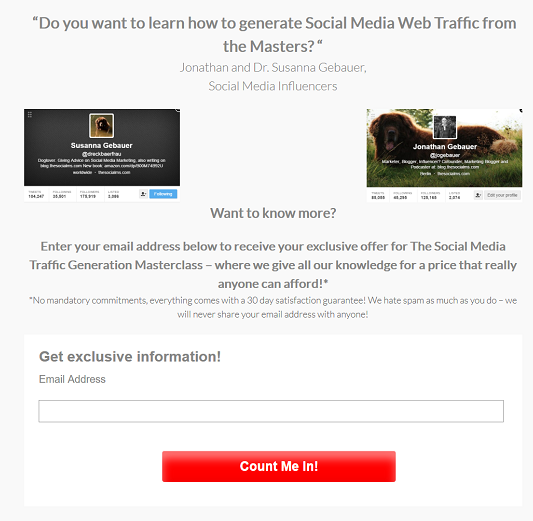 In this article, I’ll show you how to generate a lot of leads from these social platforms. According to Facebook itself, there are over 1.65 billion monthly active Facebook users. 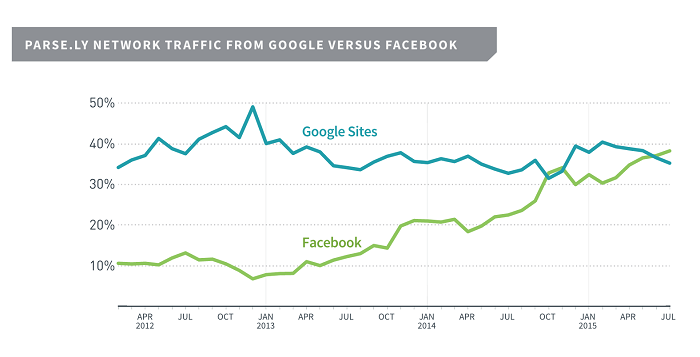 And according to a research published in Fortune by Parse.ly, a data analytics firm, shows that Facebook now drives traffic to media sites than Google. 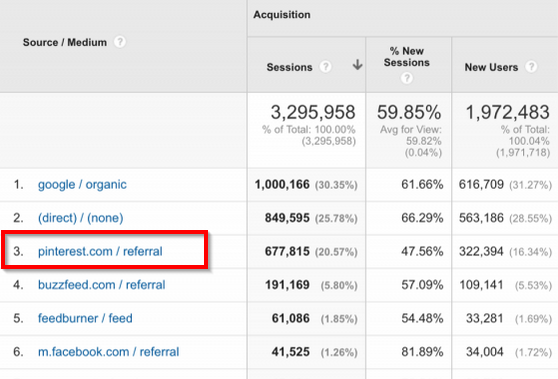 So how can you generate leads from Facebook? Depending on the kind of business you have, running contests on Facebook is an effective way to drive huge leads to your business. For example, Squaw Valley, a ski resort based in California hit 30% conversion rate and drove 6,975 new likes to their Facebook Page by running a Facebook contest. Squaw Valley chose an incentive (a pair of skis or a snowboard) that is both relevant to the brand and relevant to the current events (the Sochi Olympic Games). You’ll notice that there’s a countdown on the page. 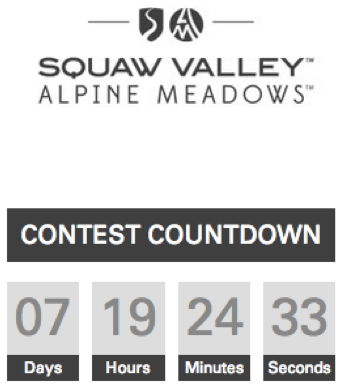 A countdown like this conveys a sense of urgency into the mind of any visitor that lands on the contest page. You’ll also notice that there are 4 steps fans must go through in order to enter the contest. 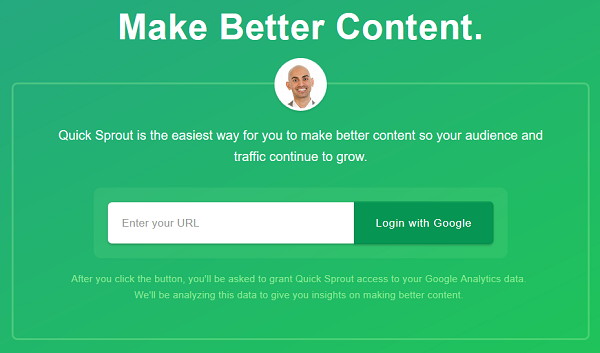 The first step asks users to enter their emails, which automatically turns them into leads. 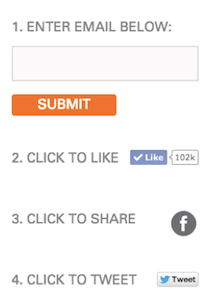 The second step asks users to like Squaw Valley Facebook page which turns them into fans. The third step asks users to share the contest with their friends, which spreads the contest further on Facebook. 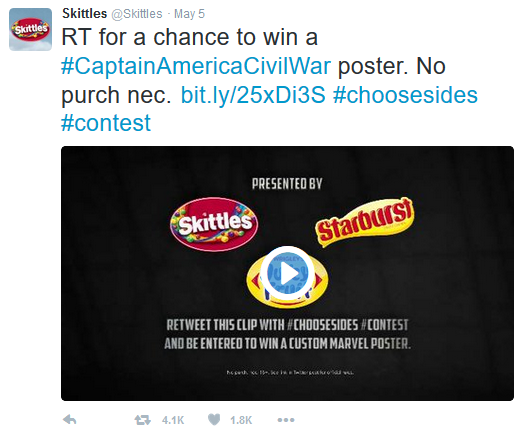 The last step asks users to share the contest on Twitter which spreads the contest even further outside of Facebook. 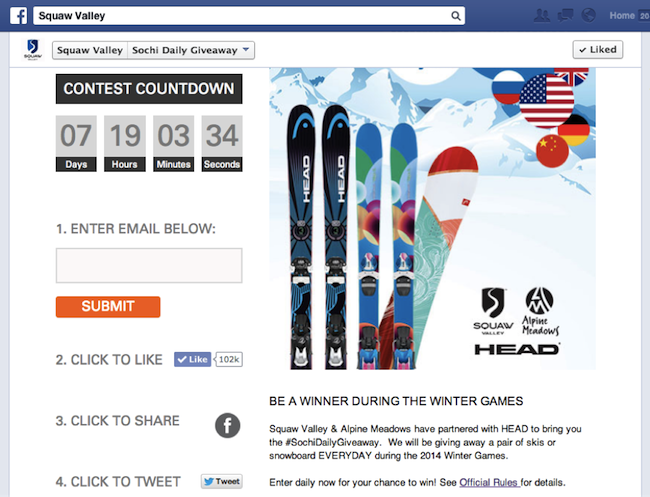 You can replicate the Squaw Valley Facebook contest template, but make sure it’s relevant to your target customers. Well, if you haven’t set-up a Facebook page for your business, now is the time to do that. People are saying Facebook is dying because of the restrictions on the news feed and the drop in reach. Some “experts” even claimed there’s no longer a reason to have a Facebook business page. For example, Copyblogger killed their Facebook page late in 2014, and they published an update about it on their blog. The blog post got 5,000 shares on Facebook alone. Isn’t that kind of weird? I’m sure you’re thinking that doesn’t sound like a smart idea. Facebook continues to be the best social network to set-up camp as a business. 1.6 billion monthly active users can’t be ignored. Maintaining a Facebook page for your business will certainly increase your exposure to potential customers. And like I said earlier, your page is a great place to gather more leads for your business. For example, Moz uses their Facebook page to ask fans to sign up for their service and take a free trial. 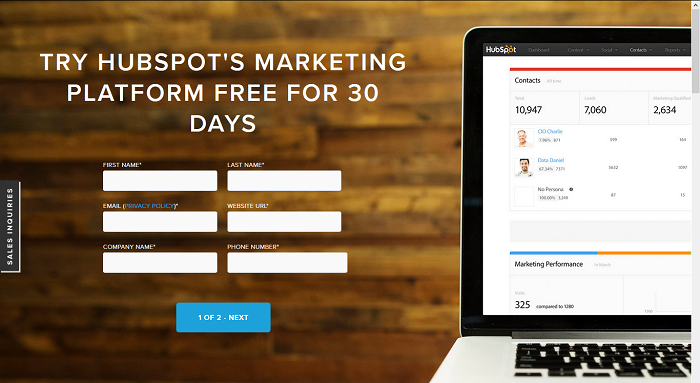 And even HubSpot is using their Facebook page to drive sign-ups and free trials to their business website. It shows they are using their Facebook page to drive leads. This is something you should do with your Facebook business page too. There’s absolutely no reason why you shouldn’t advertise your posts on Facebook. If you believe that you’re creating valuable contents on your business blog, then your target audience deserves to see it. The best way to quickly make them see your post is to put it in front of them when they’re online. This will cost some few bucks of course. If you can spend $20 – $50 to boost a high-quality post you’ve created, then if it’s truly valuable, you should expect people to continue sharing it with others as soon as your budget is exhausted. You simply can’t publish an update on your Facebook page and expect your fans to see it. 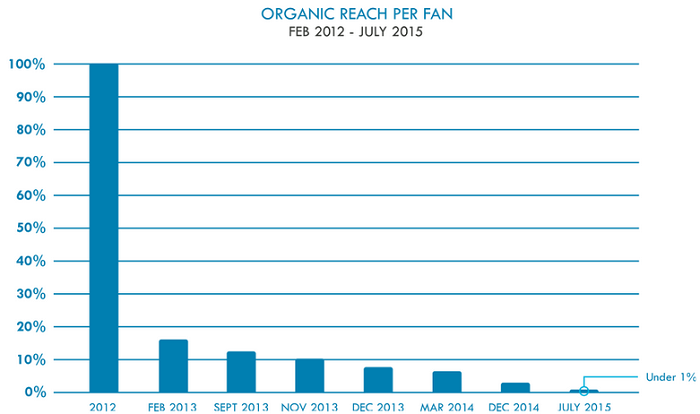 Organic reach on Facebook is long gone. The only way to play on Facebook is to pay. The logic here is if you can gradually attract a lot of people to your Facebook posts, your Facebook page will gradually gain more fans and your business will get more leads from Facebook as a result. 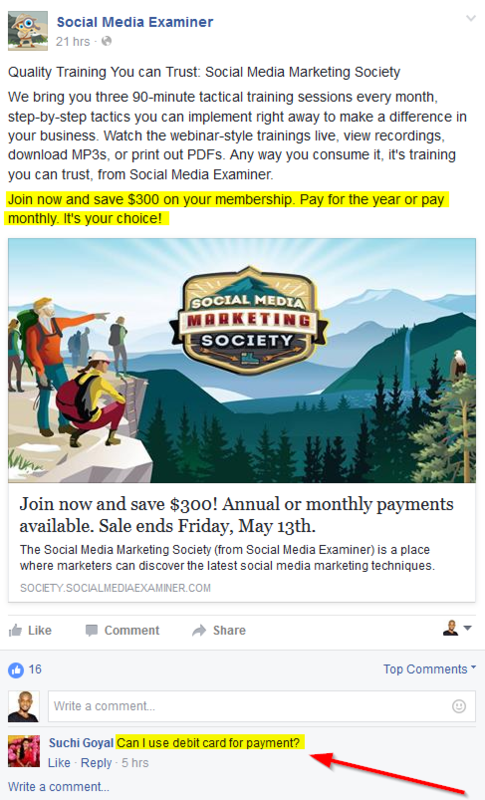 Below is a Facebook post by Social Media Examiner on their Facebook page, and you can see a Facebook user who’s ready to buy their product. This should tell you that Facebook is very effective for getting customers. 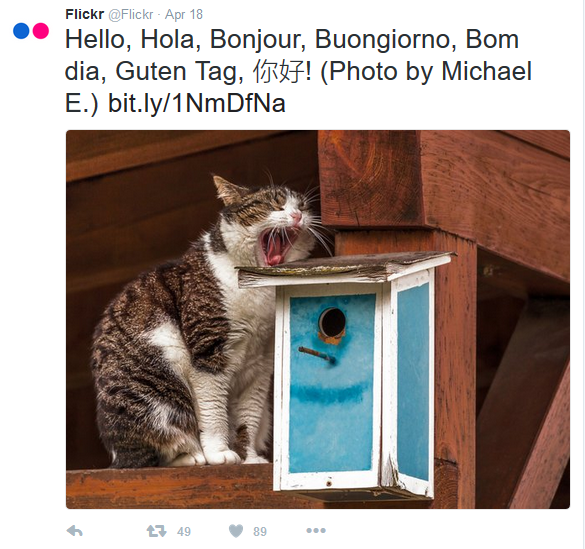 Twitter is a great place to find and connect with potential customers, whether your company is business-to-business (B2B) or business-to-consumer (B2C). With 310 million monthly active users, Twitter should not be ignored. Twitter is even more effective when your product is geared towards mobile users as 83% of Twitter active users are on mobile. You will also get your own share of Twitter’s 1 billion unique visits it’s sending to websites. If you’re really active and helpful to your target audience on Twitter, then I believe you should be getting some visits on your Twitter profile. A lot of those users who visit your Twitter profile are there to learn more about you before deciding to follow you. No doubt, having an attractive and active Twitter profile will compel them to follow you on Twitter. You can turn your Twitter profile into a lead generating machine. Twitter allows you to put 160 characters in your bio section. This is more than the traditional 140 characters because Twitter believes you need more characters to help people learn more about you. 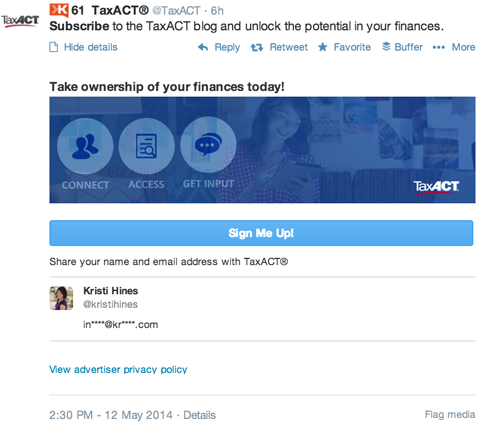 You can put a clickable CTA on your Twitter bio. 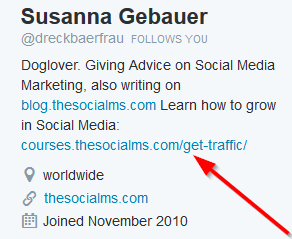 For example, Susanna Gebauer uses her Twitter bio to promote her social media traffic generation course. To turn a visitor into a lead. Every visible space in your Twitter profile is a chance to promote your brand and gain more leads. One of the most neglected places is the Twitter profile header. That’s a big huge space and you shouldn’t be wasting it. You can include a call to action on your Twitter profile header image. Most of your visitors would see that CTA because it’s a big space almost every user will look at. 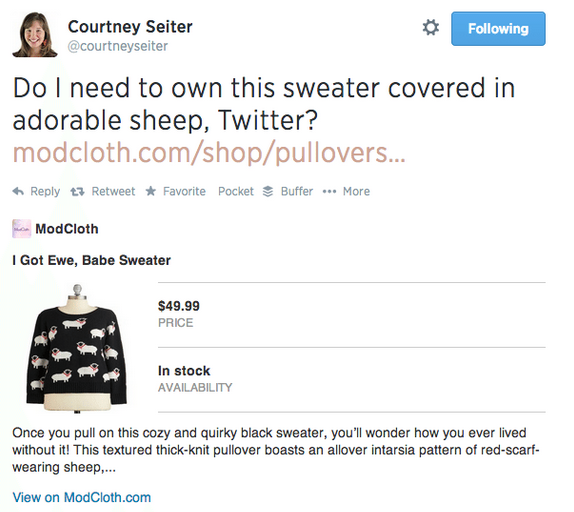 By putting your CTA there, you’ll be increasing your business leads through Twitter. 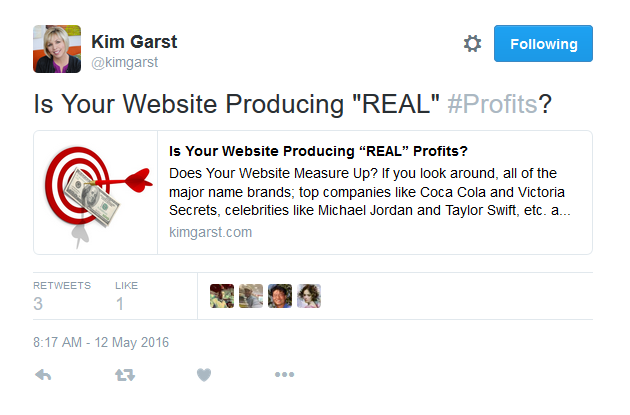 For example, Kim Garst is a Social Media Marketing Pro. She uses the header of her Twitter profile to promote her landing page where her profile visitors can download her free ebook. Donna Moritz uses a different but similar strategy on her Twitter profile. 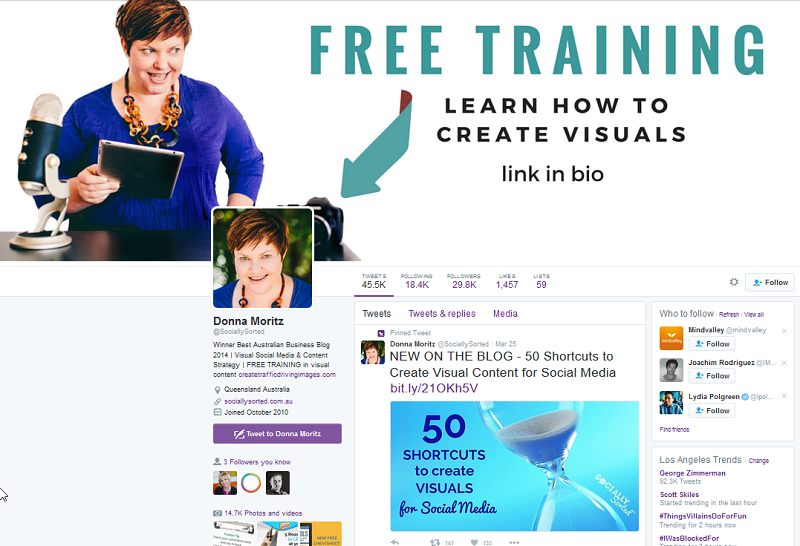 Moritz did a great job using an arrow that points to her Twitter bio where the link to her free training is located. The good news is you don’t have to be a graphic designer to create a kickass Twitter header image. With Canva, you can create an attractive Twitter header image all by yourself. If you’re not using Twitter Cards right now, then you’re missing out big time on opportunities to get more leads. Twitter Cards are ways to make your tweet more than a tweet. If you’ve ever clicked on a photo, watched a Vine, or viewed a YouTube video on Twitter, then you’ve already come into contact with a Twitter Card. All these cards are good. They enrich your tweets and make Twitter users engage with them. Unfortunately, these cards aren’t good at generating leads on Twitter. To get leads on Twitter, you need a Lead Generation Card. Twitter Lead Generation Card is specifically made to help you collect email addresses without users visiting your website. 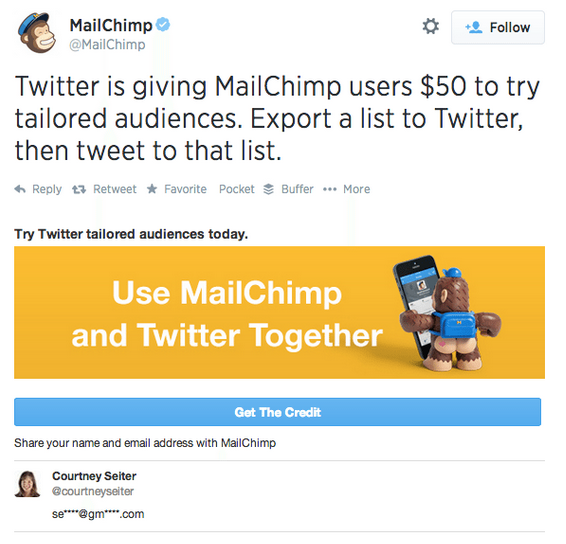 But Twitter Lead Generation Card is not free like other Twitter Cards. 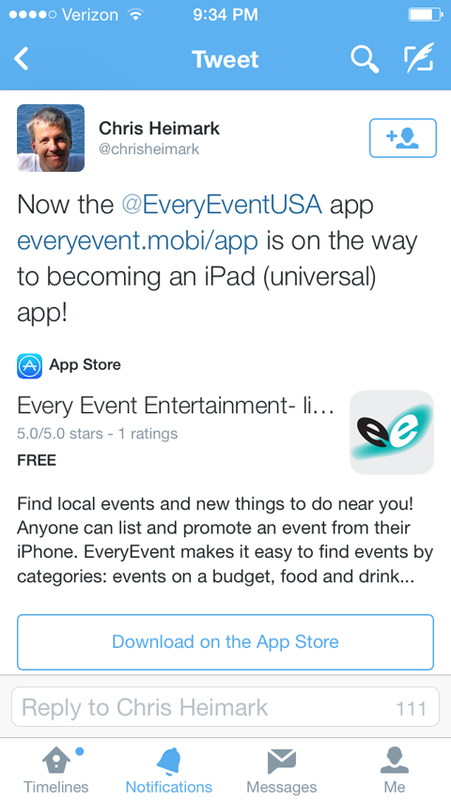 You’ll have to set it up inside the Twitter Ads Dashboard and use it anywhere you want to make a tweet on Twitter. 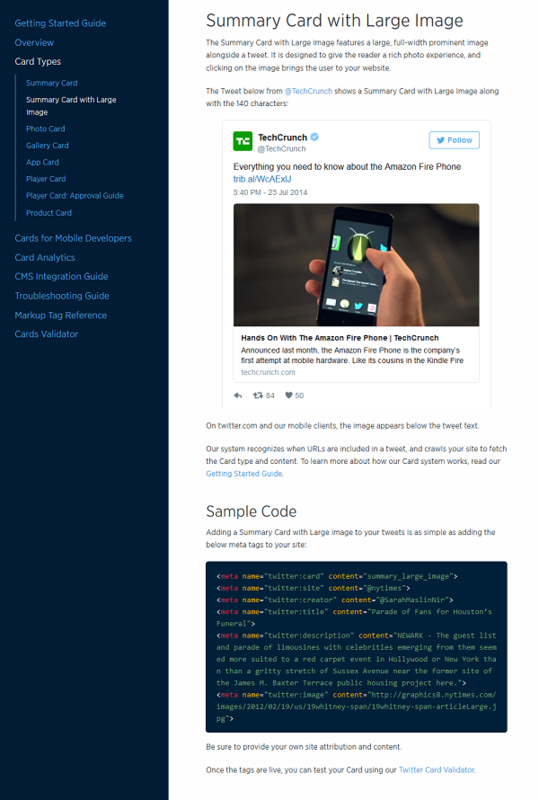 To set-up the Twitter Cards above, Twitter has tutorials along with codes to help you do that. 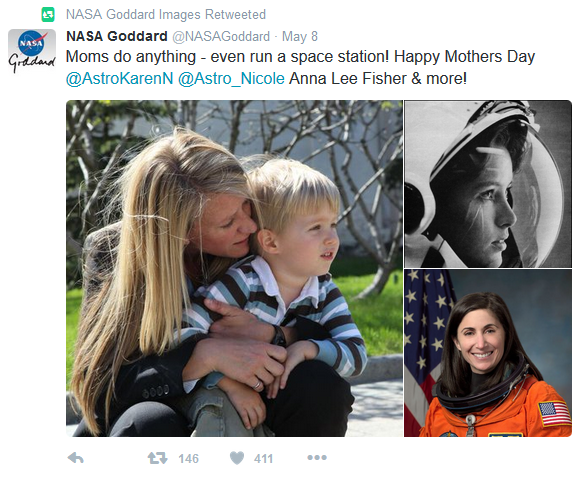 Make sure you use the Twitter Card Validator to confirm if your Twitter Card is displaying correctly. Pin is an interesting feature from Twitter that lets you pin a Tweet to the top of your Twitter profile. 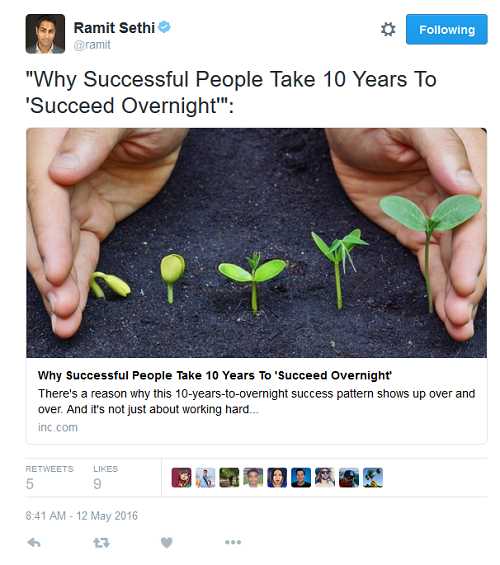 Why should you pin a tweet? You want to use this feature to send visitors to a landing page on your website so that they would become leads. You can also you use the Pin Tweet feature to do a variety of things like promote your contest or make sure an important tweet is getting retweets and spreading on Twitter. He’s using that pinned tweet to offer a free ebook and collect emails on his blog. Started in the living room of Reid Hoffman in 2002, LinkedIn is now the world’s largest professional network on the Internet. LinkedIn is more of a B2B platform than a B2C. So, if your business is B2B, LinkedIn is a great place to get high-quality leads. More than 80% of the B2B leads generated through social media are from LinkedIn. So why bother too much about other social networks if you’re a B2B? LinkedIn is the place you should be spending your valuable time. So the question is, how can you generate leads through LinkedIn? LinkedIn allows you to join up to 50 groups. But you don’t really need 50 groups to generate a lot of leads from LinkedIn. I highly recommend you join at least 5 groups that are relevant to your niche. Find the biggest and the most active LinkedIn group in your niche. You should try to become one of the most active members, if not the most active member because high visibility is the key to enhancing your credibility and making new connections on LinkedIn. When you publish a lot of helpful contents on LinkedIn groups, more users will check out your profile. And if your profile is well-crafted which I believe it is, you’ll begin receiving, at least, 3 – 5 new invites per day. As your connection increases on LinkedIn, so are the opportunities that would be coming your way. 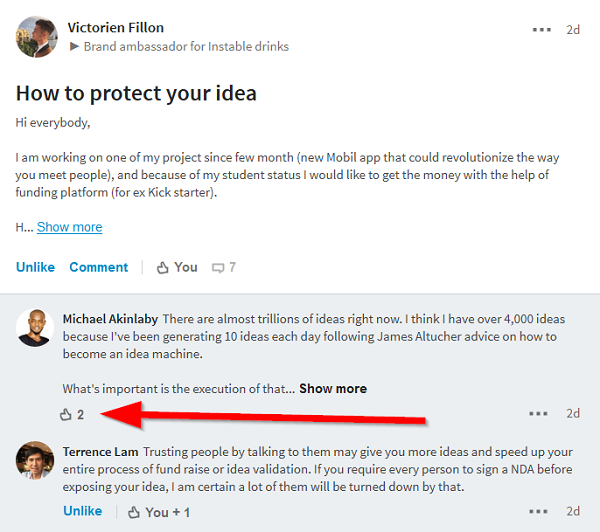 I recently answered a post on the On Startups Group and my contribution has so far brought some views to my LinkedIn profile. You don’t have to wait for someone to send you an invite. If you see someone who’s active like you are in a group, reach out to them and send them an invite. I discovered that people want to connect with me as much as I want to connect with them. Your first goal on LinkedIn is to build your connections. It doesn’t matter what you’re doing to achieve this goal as long as you’re not breaking any rule, or doing anything illegal, you’re good! Sometimes, you just want to make that important connection, but it’s not so easy because you need something that would make the other person interested in you. Yeah, that thing could be anything. One of the great ways to connect with people in your niche through LinkedIn is to create a software or a solution that solves one of their problems or biggest challenges. What you want to do with this tactic is reach out to them and tell them about your amazing tool that solves their problem for free. Most of the people you contact this way will quickly jump at the opportunity to connect with you. What you’re doing is using the software as a bait to draw people into your network. Soon, you’ll have thousands of people wanting to connect with you just because of the helpful resource you’ve created just for them. 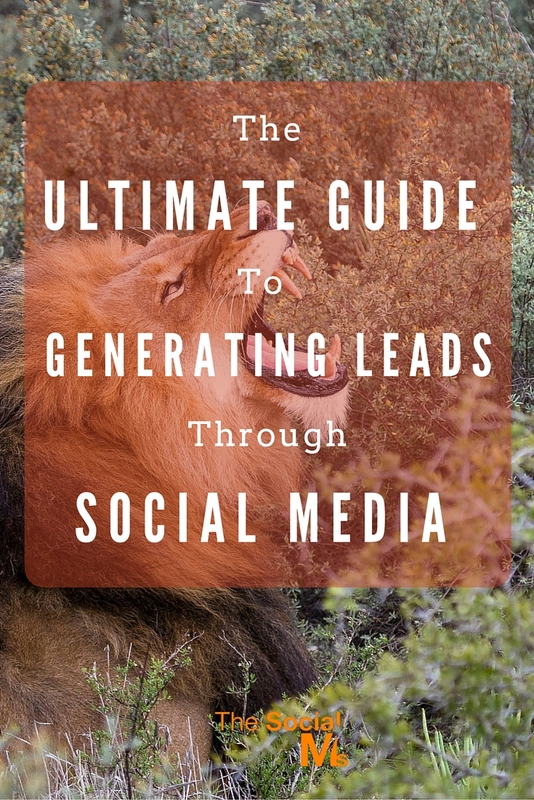 While creating the software won’t bring you leads, it will certainly bring you the connections you need to land lucrative contracts and turn your LinkedIn profile into a money-making machine. 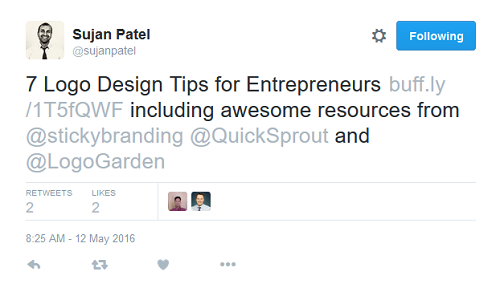 For example, Neil Patel created the QuickSprout Tool. No doubt, this tool has brought him a lot of opportunities he wouldn’t have gotten without this tool. Maybe you could create a tool like an outreach software like VoilaNorbert email finder. I used to think that Instagram was just a platform for teenagers, celebrities, and hipsters sharing selfies and pictures of tantalizing gourmet food. Oh boy, I was wrong until I saw the incredible feats various businesses were achieving with Instagram. 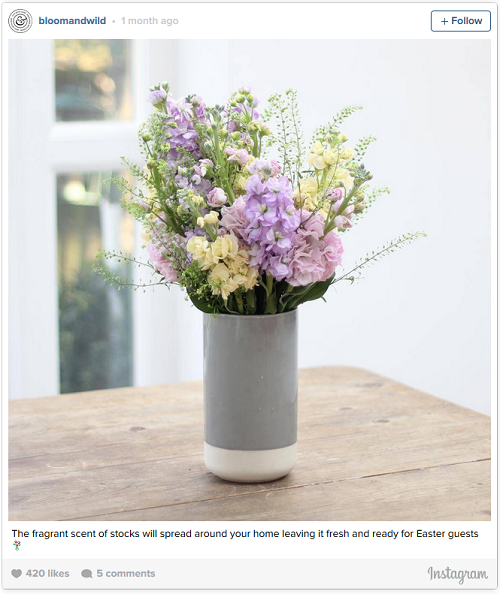 For example, Bloom & Wild increased their bouquet orders by 62% and saw many new customers commenting on their account and buying bouquets from their shop after advertising on Instagram. Instagram has 400 million monthly active users. According to a study by eMarketer, Instagram is expected to surpass Twitter in 2017 in terms of companies using both platforms for marketing purposes. Various companies are starting to realize the power of marketing on Instagram. Instagram has the best engagement rate when compared to other social networks, though its engagement rate fell in 2015 according to a study by Forrester. So how do you generate leads from Instagram? Instagram doesn’t allow links within updates. You’ll have to be a little creative to drive traffic back to your website. Since this is the only place you can put a link, you have to ensure that your link is pointing directly to a page that will turn those visits into leads. You shouldn’t just link to a random page on your website. 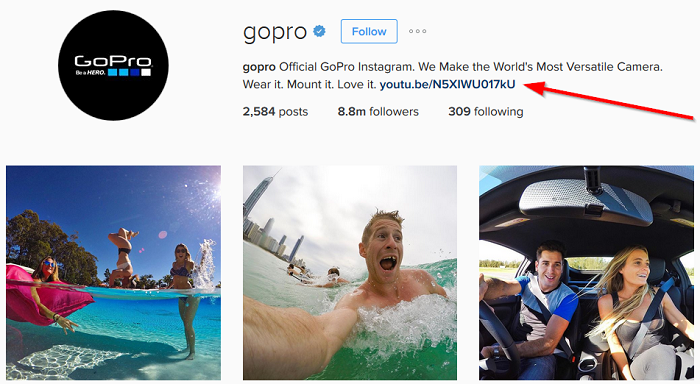 For example, GoPro is one of the top brands on Instagram. When you visit their Instagram profile, you’ll see a link to a video on their YouTube Channel. 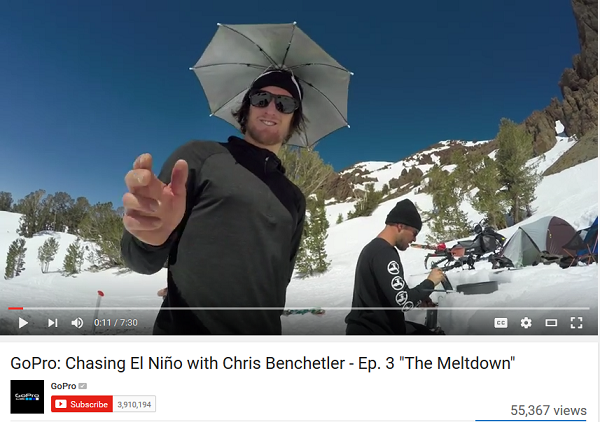 GoPro creates high-quality, creative videos and put them on their YouTube channel so customers can see their camera in action. That promotes their brand of course and make visitors want to buy their camera. If you have some engaging followers on Instagram, I see no reason why you shouldn’t be directly marketing to them. 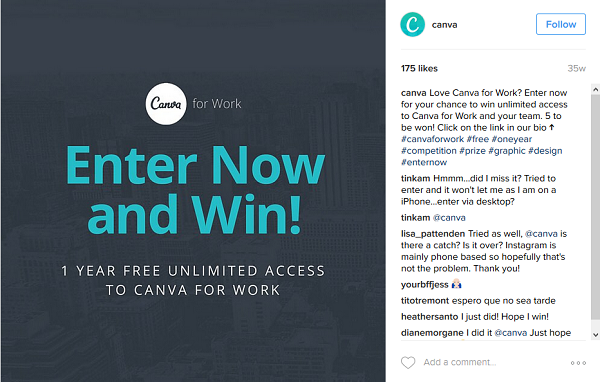 I like how Canva is promoting their product on Instagram, and I have no doubt that it’s working for them. As you can see, this update received 175 likes and some comments. 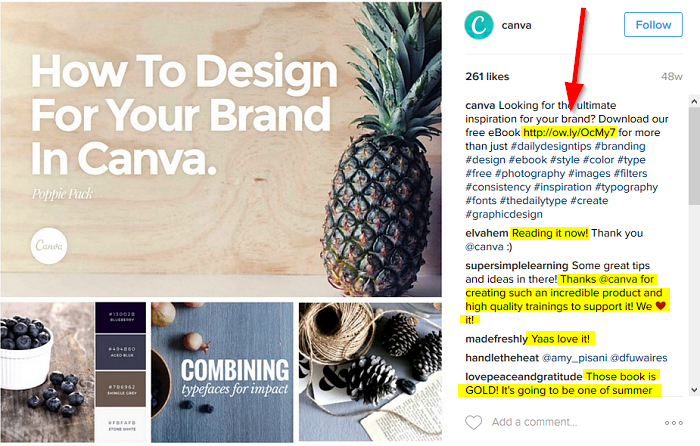 Let’s go back to the Canva Instagram page again. Here’s a place where Canva posted the featured image of their guide and put a non-clickable link in the image description. 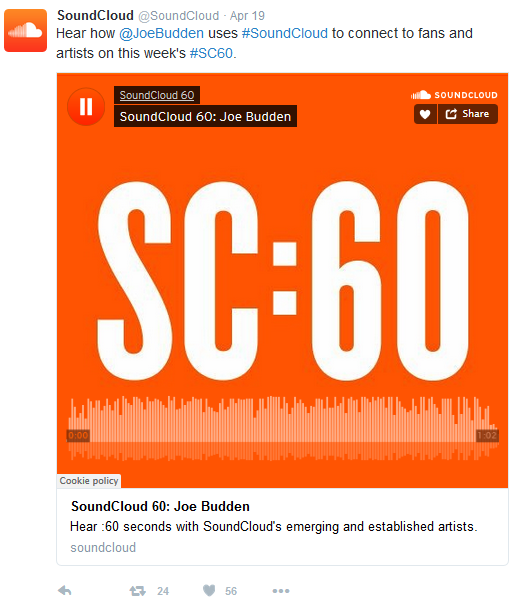 As you’ll see below, their followers could see the non-clickable link, and many read the guide which means more opportunities to collect leads. 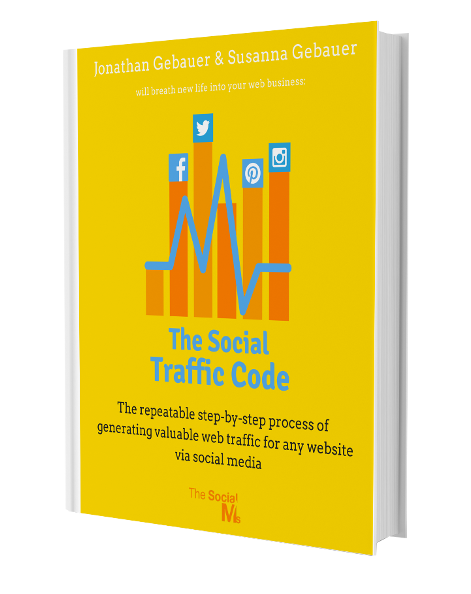 You can use a similar strategy to collect leads on Instagram. Pinterest may not be perfect for every marketer in every industry, but it’s certainly the ideal social network for businesses whose target audience is women. Pinterest has 100 million monthly active users, and 85% of its users are women. Brands such as Whole Foods, Etsy and Sephora are already using Pinterest to reach their ideal customers. 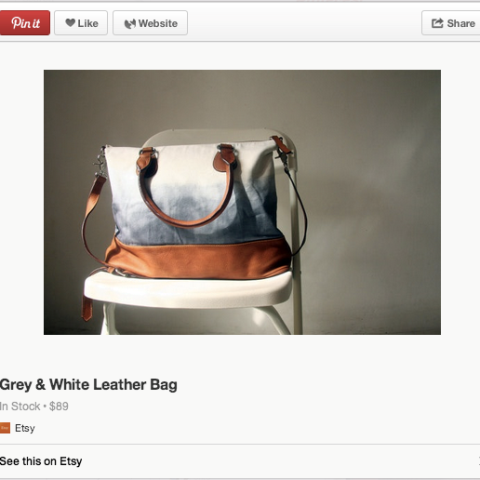 Pinterest also has Rich Pins just like Twitter’s Cards. Rich Pins are Pins that include extra information right on the Pin itself. So, how can you get leads from Pinterest? Your bio is an important place you should put your link if you want to collect leads. The more active you are on Pinterest, the more visits your profile would receive, and expect more users to click on your link as a result. For example, Lindsay Ostrom of Pinch of Yum put her website address in the bio section of her Pinterest profile. In fact, Pinterest is her top 3 traffic source, and she earns tens of thousands of dollars on her food blog as a result of this huge amount of traffic. As you’ve seen with Lindsay’s food blog, Pinterest can drive massive traffic to your blog which would certainly help you gain more leads. But you’ll have to use a lot of attractive images in your blog posts. When you have a lot of attractive images on your blog, you’ll be able to pin on a consistent basis, which means more traffic to your blog. When the Buffer blog decided to add attractive images in their blog posts and pin them 5 times per day, they started getting an average of 185 visits from Pinterest. 185 visits aren’t bad when you consider the fact that their niche is not very attractive on Pinterest. Your website can begin receiving at least 1,000 visits per day if your business is in any of the above niches. Please share this post on your favorite social site.